A fresh horseradish root has got to be one of the ugliest items in the produce section of our grocery stores. 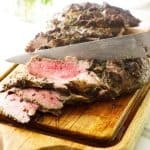 But, this unsightly root makes the most wonderful Fresh Horseradish Aioli Sauce that compliments perfectly with prime rib roast or a nice juicy steak. It is also delicious as a spread for sandwiches or over steamed/roasted vegetables. 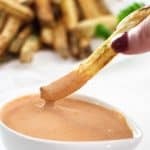 A true aioli is a garlic infused mayonnaise from France and one of the best sauces to dip a french fry into. 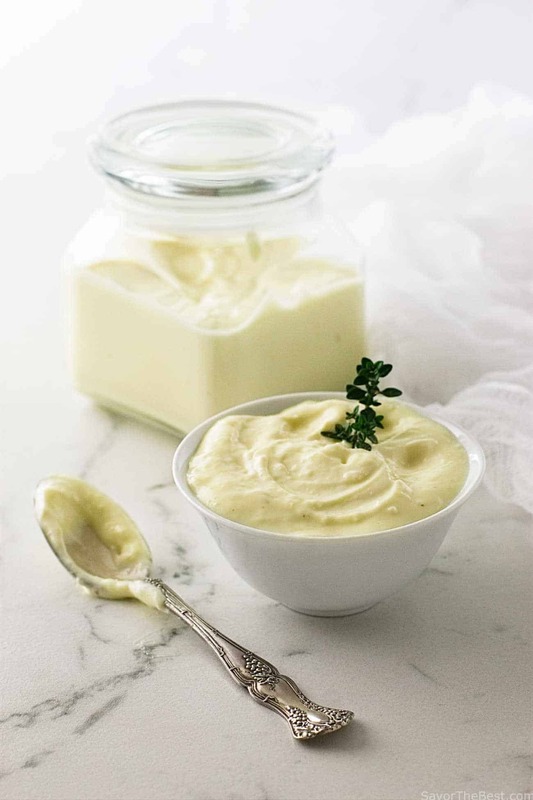 Aioli can be adapted and flavored in many ways with the addition of herbs and spices. Our recipe for Lemon-Dill Aioli Sauce is one of our favorites and we use it to accompany fish of any kind. 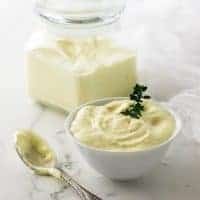 This fresh horseradish aioli sauce is perfect with beef. 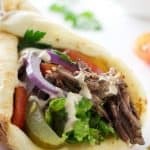 I’m dying to try it with a beef french-dip sandwich! 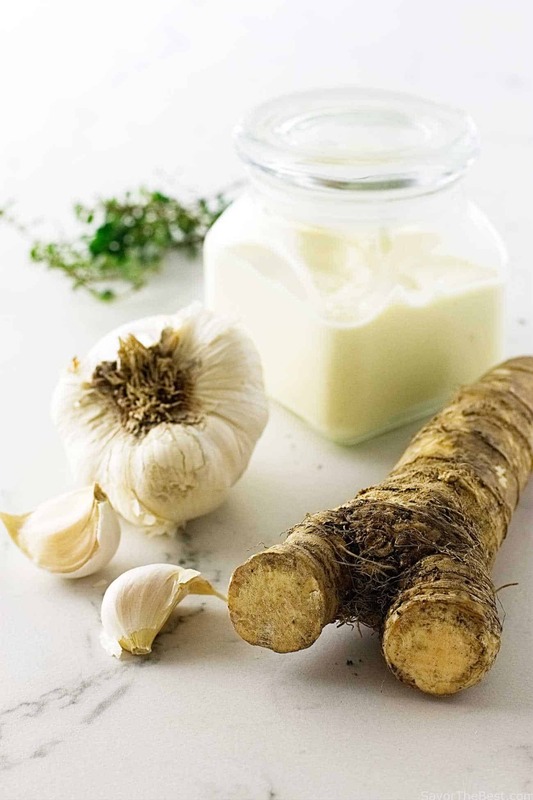 Although horseradish root will keep for a week or two in the refrigerator, it begins to dry out and loose flavor as it ages. I am betting that horseradish root is not one of the items that you purchase on a regular basis so have the produce guy cut off a smallish piece, about three or four inches long. Our recipe requires about three tablespoons of grated horseradish. At nearly $10 per pound you don’t want to purchase more than you need. 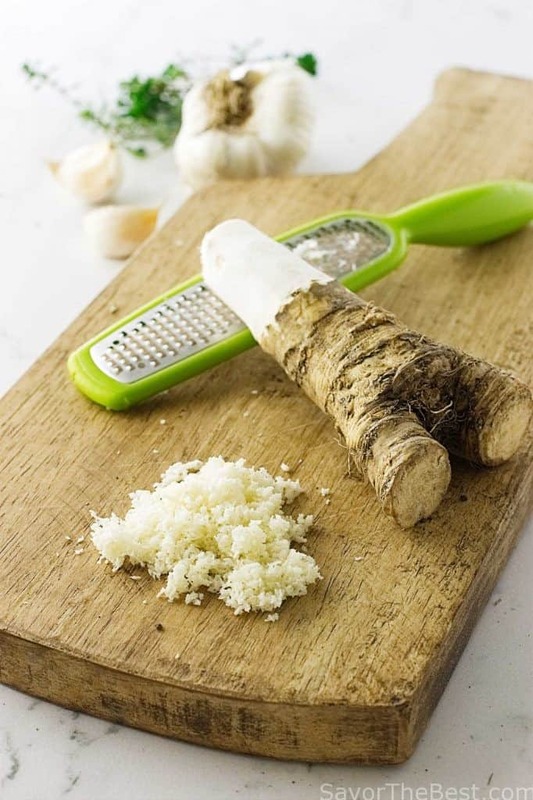 Horseradish root peels easily with a vegetable peeler and grates similar to a carrot but is fluffy and dry in appearance. However, be forewarned…..it produces some powerful fumes that will have your eyes crying and your nose dripping. 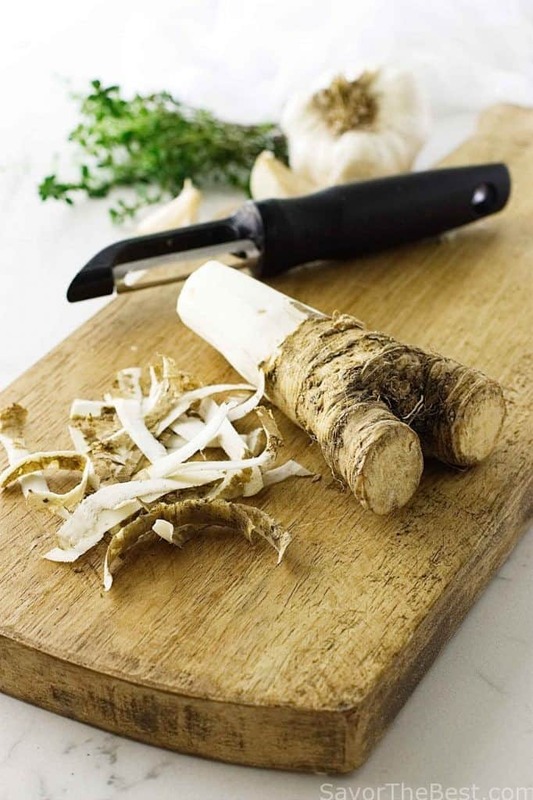 Horseradish is usually harvested in the spring and the fresher the root, the more powerful the fumes and the flavor! Making this fresh horseradish aioli sauce is definitely worth it though. To make this aioli sauce we used our mini-food processor but it can be made by carefully whisking the ingredients in a dish or with a hand-held immersion blender. 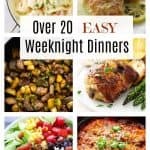 This recipe uses raw egg yolks, if you are hesitant to use raw egg yolks another option would be pasteurized eggs which are available in some grocery stores. Key to this recipe is using room temperature egg yolks as eggs right from the fridge are too cold and will cause the aioli to fail. A quick trick to bring eggs to room temperature is to place them (while still in the shell) in a dish of warm tap water for about five minutes and changing the water at least once during that time. Starting with cold ingredients is one of the main reasons for a failed aioli sauce. If your egg yolks are still cold from the fridge, you will have trouble getting the mixture to emulsify and end up with a runny mess. 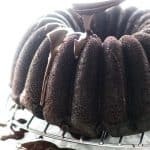 Another tip that is key to the success of this recipe is to drizzle the oil in slowly. Should you happen to drizzle too quickly and end up with a runny, broken/curdled looking aioli, don’t despair. You can fix a broken aioli with another egg yolk. Pour the broken aioli into a bowl and place a fresh, room temperature egg yolk in the food processor or blender. Start processing the egg yolk then slowly add the broken aioli back into the processor. You can add a bit more oil after the broken aioli has been added. If you find the aioli is too thick then you can drizzle in some water to thin it down. When the aioli has blended together to a smooth consistency transfer it to another container, and after you have done your ‘happy dance’ stir in the grated horseradish! And here is another idea to use with this amazing sauce. We made these beef steak bites with fresh horseradish aioli sauce. What a great appetizer for your next party. 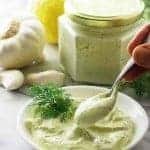 A classic aioli sauce flavored with fresh horseradish that pairs perfectly with beef, dips, sandwiches, steamed and roasted vegetables. 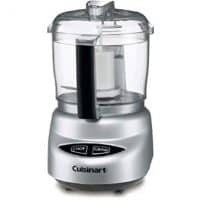 Place the garlic, mustard, lemon juice, egg yolks and thyme in the bowl of a mini-food processor, or blender. Process until evenly combined, about 10 seconds. With the motor running, slowly add the olive oil in a thin stream until completely combined. This should take about 2 minutes so drizzle very slowly and make sure you don't add more than 1/4 cup in the first 30 seconds. Once you have a thickened sauce, stop the processor, taste and season with salt/pepper. Continue to pulse the ingredients until thoroughly mixed and to a thick consistency. 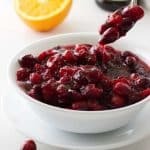 Stop and scrape down the sides of the bowl with a rubber spatula, then pulse until all ingredients are evenly incorporated. Transfer the aioli to a jar or dish and add the grated horseradish, whisking until well combined. Let sit for at least 30 minutes before using. Refrigerate in a container with a tight fitting lid for up to one week. Using room temp eggs and slowly drizzling the oil will ensure a successful aioli sauce. Although I really like the flavor of horseradish, it’s not something I use all that often. So I admit, I rarely buy the root. And instead buy the prepared stuff in those jars. Good, but not as good as making your own. This looks perfect — thanks.